I had not been to the North South Trader's Show in Richmond for some years. My gut told me to make the trip yesterday and am glad I did. About a quarter of the way through the show I walked by C.J. Delery's table (he operates The Historical Shop, and I have a fond memory of a Pennsylvania show some years ago at which I of purchased a pristine group of officer cartes de visite, all members of the Fifty-third Massachusetts Infantry). Delery asked if he could help. I told him about my latest project and he pointed me in the direction of Howard Norton's table. Within a few minutes I was at Howard's table looking at a quarter plate tintype of Pvt. William Wright of the 114th U.S. Colored Infantry. An airtight identification by way of a piece of paper attached to the back of the metal plate, inscribed in period pen. To be certain that Wright was a member of the regiment, I whipped out my laptop only to find there was no wireless access in the building. So, I called up Anne at home and joked that I was stuck at the Civil War show and required immediate table-side assistance from "AnneStar." She logged on to our home computer and I guided her through the American Civil War Research Database operated by Historical Data Systems. In minutes she verified that Wright did indeed serve in the 114th. I left with the image, a detail pictured here. Howard and I talked for awhile after completing the purchase. Turns out he had come into possession of this photograph six weeks ago after buying a group of images from a Missouri collector. Howard is a long-time dealer, and I've seen him at a number of shows. His soft Southern accent reflects his Mississippi roots and birth in Arkansas. He is sixty-eight years old. His father, a Spanish American War veteran, was the same age when Howard was born. We finished our conversation reflecting on our shared joy of Civil War photography. "The ability to see the face of a soldier, then read about his life and what happened to him in the war is a powerful thing and it puts me in a different place" I explained to Howard, who nodded his head in agreement. He knew exactly what I meant, "I know, I know. You're There. It takes you There." Howard Norton said it better than I could. Today I attended the Gettysburg Show with Anne. We left early to make the ten o'clock opening, armed with business cards, books and my trusty laptop computer and scanner. Turned out to be a great day of progress for the African American soldier book. Thanks to Ronn Palm and Paul Rusinoff, I had the opportunity to meet Tim Kernan, who generously allowed me to scan a pair of spectacular quarter-plate tintypes of brothers who served in the First Regiment Iowa Volunteer Infantry (African Descent), later designated as the Sixtieth U.S. Colored Troops. I look forward to learning about them, and am happy to make the acquaintance of Tim, a good guy who shares my interest in making these stories available to a wide audience. The third image comes from the holdings of dealer and historian Henry Deeks, who inspired me to research and write about Civil War soldiers. 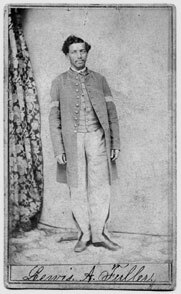 The carte de visite of Lewis A. Fuller, reproduced here, is the first identified African American soldier in my collection. Anne and I left the show with three new additions for the book and celebrated with a lunch at Dino's. Definitely a day to remember. I have expanded my Flickr account to include a new collection, Current soldiers under research. The soldier cartes de visite here are intended to appear in a future "Faces of War" column in the Civil War News. 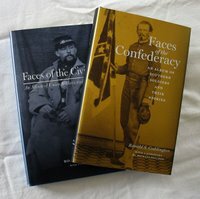 My motivation for adding this collection is based on the success I've had with postings on The Civil War Message Board Portal and GenForum. Both sites attract authorities and others knowledgeable in the Civil War and genealogy. 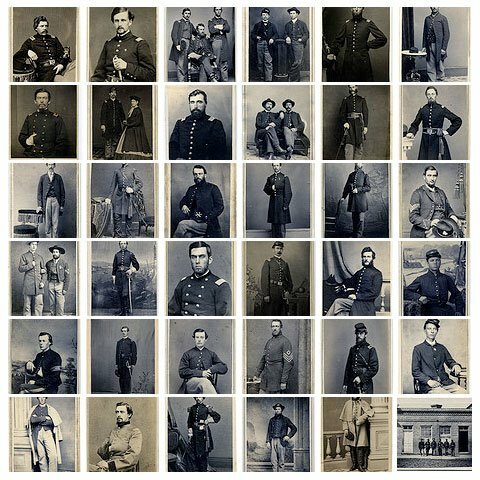 This Flickr collection seeks to tap into those with knowledge of Civil War photography. I am hopeful that it will generate additional details about the lives and military service of these men, and perhaps other wartime and post-war photographs. Late last year I purchased a nicely tinted carte de visite of a long-haired woman dressed in bloomers, identified only as "Nellie." This wonderful photograph prompted me to think about other tinted images in my collection, and I began searching for other colored cartes. In the end, I found a variety of images. The photograph pictured here is perhaps the boldest example, which, with the exception of the background, is fully tinted. On the other side of the scale, a federal officer poses in black and white, although the medal pinned to his uniform is colored in vivid red and blue. Check out the gallery of eight cartes that illustrate the full range of tinting. "What if you entered history through not the general, but a particular. Something really, really specific, like a moment in time and a specific place, almost picked at random. What if you could enter history through a photograph? Take the photograph and ask yourself, what can I learn about this?" Documentary filmmaker Errol Morris poses these questions and follows through with additional conversation on history and photography in this YouTube video. 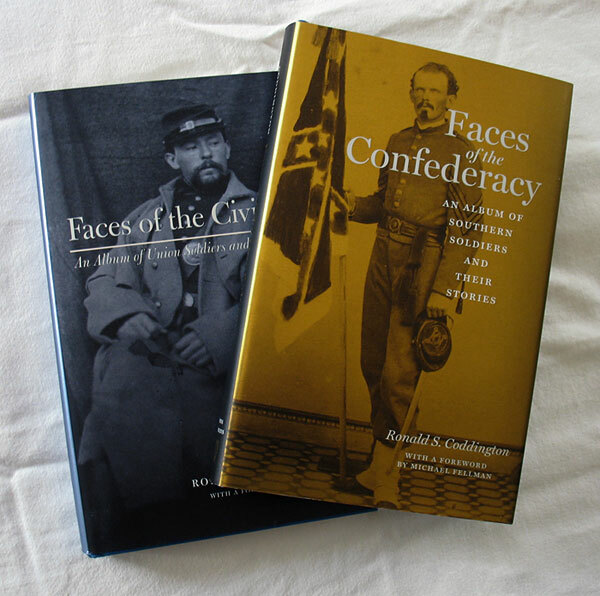 Morris' comments capture an essential element that drives my research of Civil War soldier photographs. 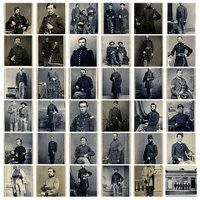 Each carte de visite is an entry point into the Civil War era, and, in learning about the life of the subject, I organize a chronology of his life. After careful reflection and thought, I eventually settle on a time and place and event that begins his story. Although the experiences that shape the soldier's life can be measured in an orderly fashion across the timeline that spans his life, I have found that by focusing on an essential element of a soldier's character, or a cataclysmic event that forever changed his life, or an anecdote that reveals the nature of the soldier, that my finished profiles are never presented in chronological fashion. The result is a very particular entry point, one of an infinite number, that contribute to a better understanding an appreciation of the war. Many thanks to my friend and co-worker Wes Lindamood for sending Morris my way. 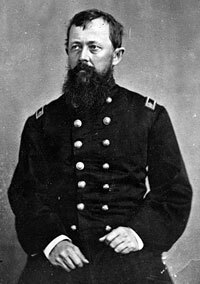 Dr. Reed Bontecou (1824-1907) left behind a massive amount of textual and visual material in his six decades as a physician, including five years as a surgeon in the Second New York Infantry and U.S. Volunteer Medical Staff. I have a folder on my desk bulging with documents, and file folder on my laptop desktop with numerous pdf files and a twenty page Word document of preliminary notes gathered over the past two years — the most time I've spent researching a single subject. I've enjoyed every minute of the research, and it is with mixed emotions that I write his profile and bring this project to a close. Bontecou is a fasinating study. His name will likely ring a bell for those who have seen examples of the hundreds of pre- and post-operative photographs of wounded soldiers he ordered taken while chief of Harewood Hospital in Washington, D.C. "Bontecou is considered by photographic historians as probably the first to practice the application of photography to the field of military service," noted one biographer. The time was spent tracking down various primary and secondary sources, and following several related stories. For example, to represent Bontecou's collection of images, I researched the life and military service of Pvt. Lewis Maston of the Second New York Cavalry. He came under Bontecou's care after suffering a wound at Five Forks that resulted in the amputation of his left leg at the knee. I also had to learn about the history of the formation of the Army Medical Museum. I am still in awe that, in the middle of a major war and national crisis of the first order, that the surgeon general would have the vision to establish a museum to improve soldier care and provide a base of materials from which doctors could study and learn and save lives. 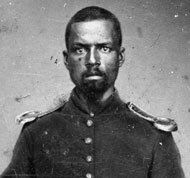 I plan on publishing Bontecou's story in the January issue of Civil War News. It has been more than a month since I received the issue of the Civil War News with the story about the Twenty-ninth Connecticut Colored Infantry, illustrated with a wonderful carte de visite of two sergeants from the regiment. The image motivated me to get serious about beginning the search for identified, wartime cartes of those who served in the U.S.C.T. Researching and writing about the African-American war experience is a natural next volume in this series. Last week, I officially began by making contact with Harrison Mero of the Twenty-ninth descendant’s group. He was extremely helpful, offering to provide me with details about the two soldiers, and put out the word that I am looking for photographs. He also directed me to Yale University’s Beinecke Library, which owns the carte. I am on the track of a few more images. Seventy-seven are required (to be consistent with Union and Confederate Faces). If you can help, please contact me! My criteria is identified, wartime cartes de visite of African-American soldiers. "The Art of the Carte" has been enhanced with additional images and a new look. The exhibit has been expanded to eighty images, arranged in ten galleries grouped by subject. More cartes will be added in the future. This gallery celebrates the artists and their contribution to vernacular photography during the Civil War period. The images are displayed in Tiltviewer, a 3D Flash viewing application by Airtight Interactive. Airtight makes a free version, but I used Tiltviewer-Pro, which allows for customization. I chose Tiltviewer because it allows a user to preview thumbnails, enlarge them in a single click, then flip the image to read the caption. In short, the navigation is the content. Also, its intuitive interface and organic qualities are a big plus.